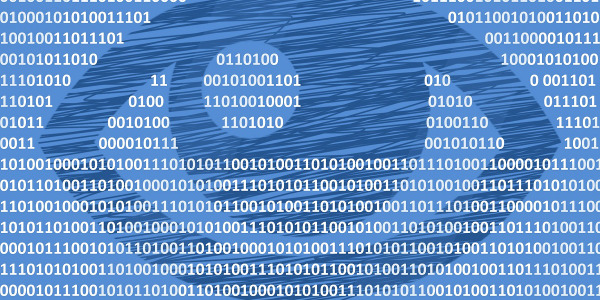 What's Behind the Tight Freight Market, and How Long Will It Last? 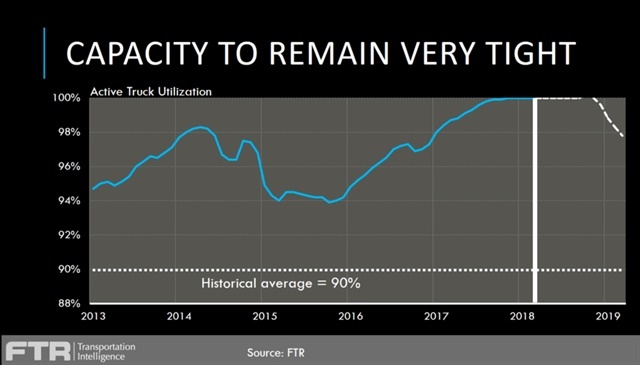 Although the April 1 start to “hard enforcement” of the electronic logging device mandate does not seem to have had a huge effect on trucking capacity (except perhaps in flatbeds), there are a number of other factors that are working to keep capacity tight and rates high, likely at least until late this year, according to FTR. 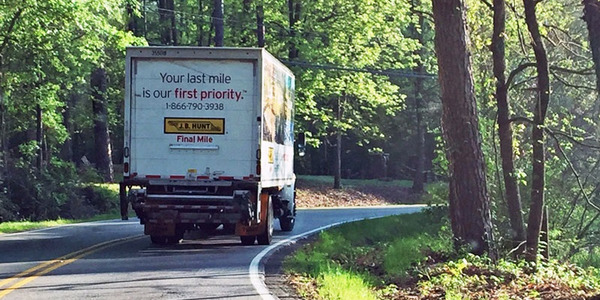 Avery Vise, FTR vice president of trucking research, shared the latest data with callers during a May 10 State of Freight webinar. The key economic indicators affecting trucking are all positive, or at least neutral, he said. One possible concern is business inventories, which have ticked up higher recently. 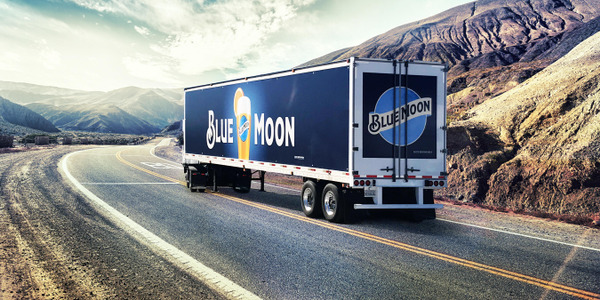 Potential reasons for that could be related to the need to keep product closer to customers for online sales, or even a reaction to the trucking capacity shortage itself, he said, as companies hold back some slower-moving inventory. Of course, there are a number of external factors that could affect that rosy picture, including trade tensions and rising oil and fuel prices. 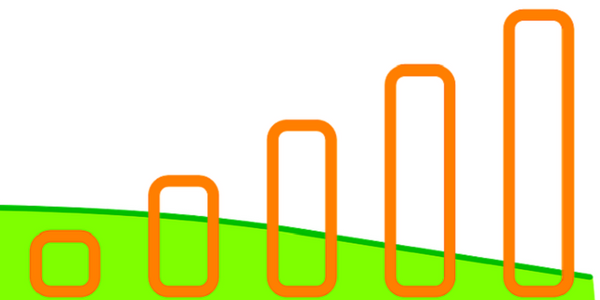 But overall, Vise said, we can expect continued growth in the near term. 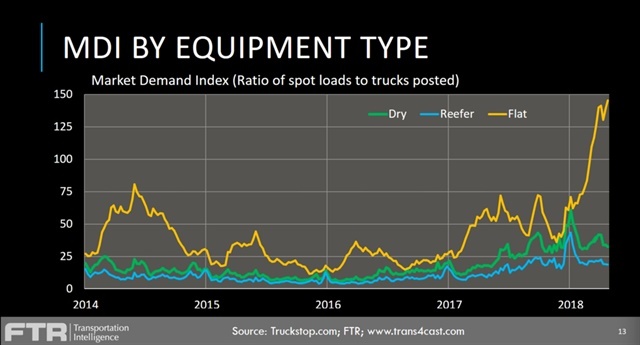 The flatbed sector is especially hot, and FTR expects loadings to be up 7% to 9% year-over-year through the year, perhaps even higher. Growth in van and reefer will not be as spectacular, but both will be solid through 2018. But what everyone really wants to know is, how has hard enforcement of the ELD mandate affected capacity? The best indicator for this, Vise said, is the spot market. 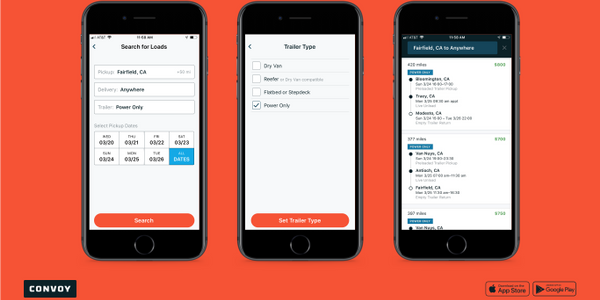 Data from Truckstop.com, he said, suggests that capacity was tightening well before the initial December 18 ELD deadline, as many fleets went ahead and phased in the use of electronic logs before that date. “We did see a pretty substantial jump” during the first week of the ELD mandate, he said. Even more curious, he said, is what happened with weekly ELD violations, which actually dropped during the first week of full enforcement. One possible reason for that is that carriers simply waited to install or activate their ELDs until the hard deadline, knowing that until then the violations would not mean an out of service violation or CSA points. 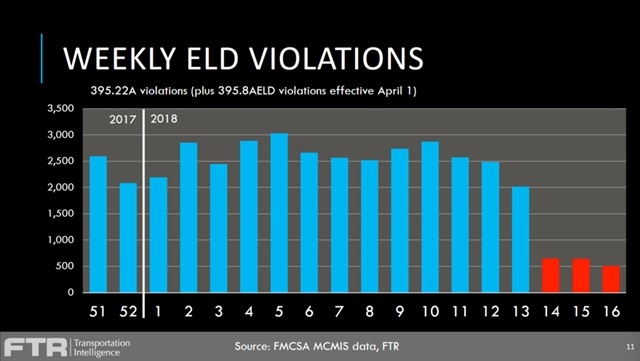 However, the data also shows, unsurprisingly, that non-compliance with the ELD mandate “has been almost totally on the lower end of the market… nearly 80% of violations are carriers with fewer than 20 trucks.” Carriers with 101 to 999 trucks made up only 3% of the violations. 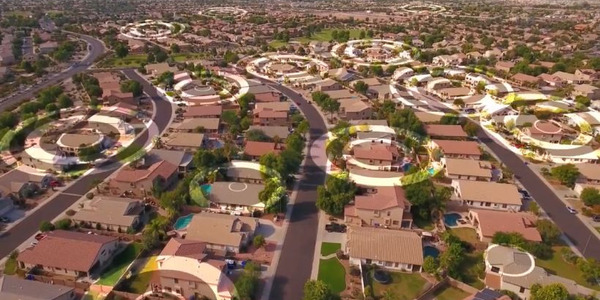 Why Is the Flatbed Sector so Hot? 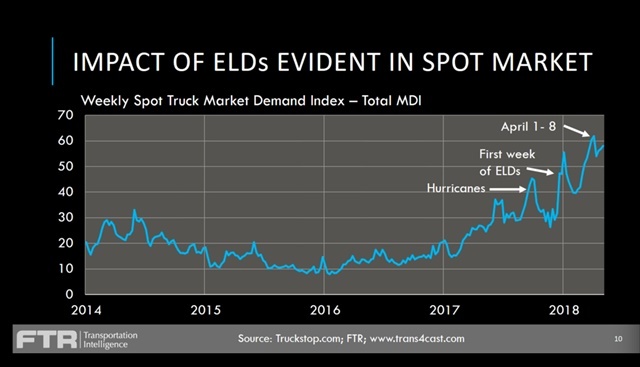 Truckstop.com’s Market Data Index tracking the spot market is overall in record territory, but that is principally due to “unprecedented tightness” in the flatbed sector, Vise said. Flatbed rates are up 45 cents per mile since the end of 2017, while van and refrigerated freight rates are down from their year-end highs. Several possible reasons are combining to create this situation, he said, both on the demand side and the supply side of the equation. There’s more demand for flatbeds coming from recent strength in manufacturing and construction, as well as recent increases in petroleum prices pushing more domestic production. 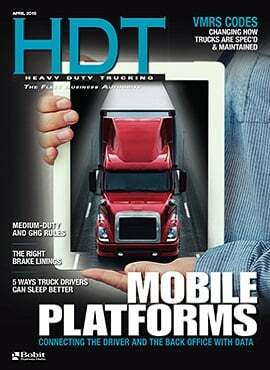 On the supply side, Vise said, many people think the ELD mandate is hitting flatbed the hardest. 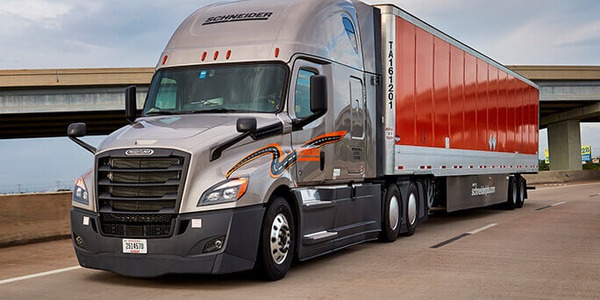 This sector includes a lot of owner-operators and small carriers and is typically not the first to adopt new technology, he noted. 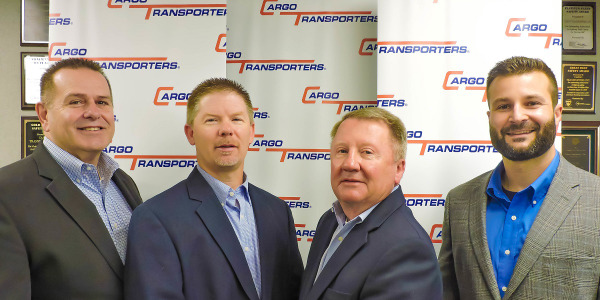 For over a year now, fleets have been saying that they could haul more freight if only they had the capacity to do it – chiefly limited by the driver shortage. And that’s certainly still continuing. What’s the Outlook for Trucking Capacity? 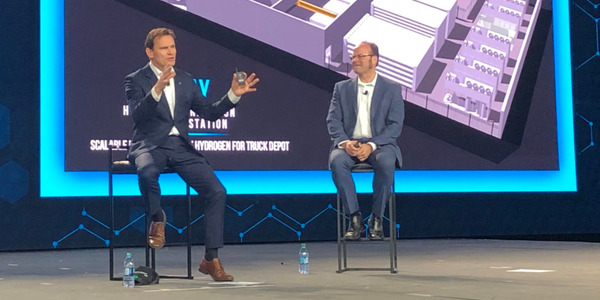 By that point, he said, fleets will have taken delivery of new trucks and trailers that are currently in the production pipeline, and aggressive driver recruiting efforts may have borne fruit by then. Also acting to help ease the capacity crunch will be things like schedule changes, more drop-and-hook operations, and other ways to eke out more efficiencies and take out lost time. As a result, he said, FTR expects elevated year-over-year growth in rates to continue through the second quarter, but to come down somewhat from “fairly inflated levels” later in the year. Don’t expect that change to come from any reprieve from the ELD regulations, Vise said – although he sees it as “quite possible” that a current temporary exemption for livestock haulers will be made permanent. More likely, Vise said, would be relief from the underlying hours of service rules themselves, although that’s a longer-term prospect. He pointed out that there’s a pilot program under way to test moving back to a split-sleeper berth option, and the Owner-Operator Independent Drivers Association has petitioned for the ability to pause the 14-hour on-duty clock once during a shift for up to three hours. “If these things come together during a business-friendly administration, I would anticipate a good chance that one of these has a chance of happening in the next few years,” he said.